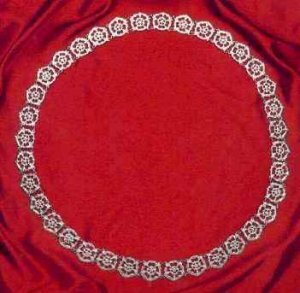 Collars of heavy ornaments, often the work of goldsmiths, sometimes set with jewels, were in great favour with royalty and nobility in the Tudor period, often being worn when in full or semi-state dress. In a portrait at Windsor Castle, Arthur, Prince of Wales (the elder brother of Henry VIII who predeceased him), wears a collar of roses. Three finish options are available: Pewter or Gold Tone (a spray-on enamel and lacquer finish -- add $20). Pewter. 118cm long. Made in the United Kingdom, assembed in the United States of America.